Fasten your seat belt, put on the super cool 3D glasses, hold on tight to your seats, and get ready to tumble and rumble in Sentosa 4D Adventure Land on Sentosa island. 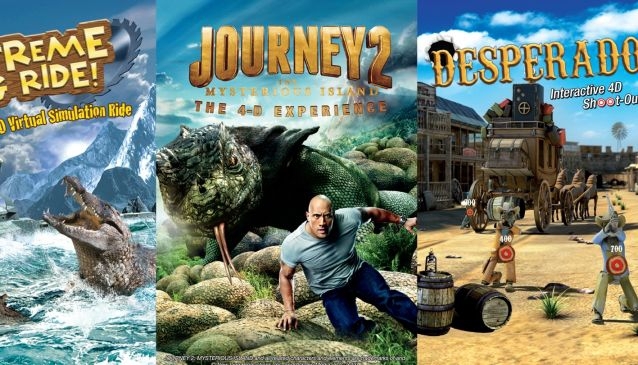 The one-day adventure pass includes unlimited entries to: 'Extreme Log Ride', a virtual 4-D roller coaster; 'Desperados', Asia's first 4-D Interactive Shoot-Out game; 'Journey 2: The Mysterious Island, The 4-D Experience' and 'Happy Feet: Mumble's Wild Ride', the latest 4-D movie. Take note that some of the rides require some height restrictions: Journey 2/ Extreme Log Ride: Minimum 90cm and Desperados: Minimum 110 cm. Last ticket sale, redemption and entry are at 8.15pm.